Picture from April 2019 by author. The distinctive shape of this building is recognizable as a former Circuit City, which was built in 1995. I maybe went into Circuit City once or twice in this location, but I do remember it as a dimly-lit place with computers on display (typical of Circuit City, and that was their gimmick, for the darker lighting to better show off computers and televisions), and nothing like Best Buy, which was brighter and better organized. In January 2007, Circuit City moved to a new location at University Drive and Highway 6 (about where Half-Price Books is today) and closed down their location, only for the new location to close down a few years later. ("Bryan-College Station sees boom in businesses" from The Eagle). In early August 2012, Guitar Center opened a store at the location but it retains its original architecture. Back in 2013, I wrote about Alta Vista Christian Academy, which included a bit about the west part of Rock Prairie Road and mentioned these, some stables that had been on the road (originally Gandy Road) for a number of years. A few years ago, the land went up for sale on this one, and I knew I had to act fast: because a month ago or so, the city had revealed Equinox subdivision, which would eventually become "The Revelry Townhomes". And that's when I took these pictures. Diamond T seems to have opened in the early 1990s. 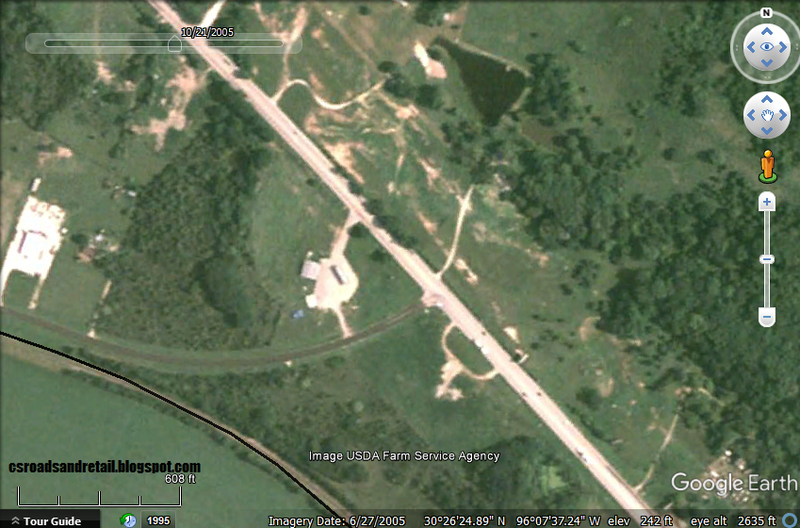 Google Earth shows them there in 1995 and my 1998 phone book lists it, but the 1993 ones (and earlier) do not. Soon after I took these, the entire property was completely torn down and construction on the new development began. The Diamond T Storage next door continues to live on, though, but for how long is anyone's guess. Updated 11.15 with new title, slightly updated information, and other minor changes. "And a screen without a picture since Giant came to town"
This is a very, very old post that I'm finally posting again after putting it away for a few years. I originally posted this after the fall 2011 Texas Reds Festival (and it's a good thing too: summer was especially brutal), where I saw the newly revitalized Queen but was disappointed about the redevelopment plan, ate some steak and fried Oreos, etc. (but no beer or wine). The map I was intending to scan (different blog standards at the time, you see) had gotten so much powdered sugar on it I declared it was a loss and threw it away. My opinion about Downtown Bryan has changed somewhat. At one time I felt it was too sanitized and cartoonish but even those have gotten some wear into them like breaking into a pair of tennis shoes. It's certainly better than the alternative: crumbling into decay and ruin, as it was circa 1990. Sadly, I have no pictures of how it was and how I remember it in the 1990s. Fortunately, I do however have a music video of "This Old Porch" sung by notable country-western singer (and TAMU alumni) Lyle Lovett. "...But Bryan fell on hard times, like so many downtowns and towns of all sizes in the '60s when the shopping centers began to spread, same kind of thing happened here......Several attempts have been made by people who said 'well, we could rescue this place, look at these fine wide streets down here, this would be a pleasant place to shop, live on a...make a kind of historic district out of it' but there's really not enough population to do the kind of things they've done in Denver and even in Houston to some extent. And so, it just gets worse.....It just isn't happening. It's not likely to happen now. Bryan did ultimately did "rescue" the downtown, by sinking tax dollars into it. And though they weren't able to truly revive it as it was in its "glory days", it managed to coax in new shops and businesses. Boarded-up buildings, empty storefronts, and peeling paint were ultimately done away with, but it seems like some of it has been lost (at least they never did convert it to a pedestrian mall at any time. I felt a bit nostalgic watching this: not because I actually lived in that era, but the downtown like I remembered it. The Palace Theater, in particular is featured prominently: the withered curtain still intact, with a shot of the fire escape next door. I remember that fire escape. I was at a Mexican-themed festival there years ago, and rather than watch the dancers on stage, I was drawn to it. There was something about it, some vaguely spooky and depressing feeling that was later seen in things like desolate old malls and Detroit buildings. That's what today's post is about. Starting in the late 19th century or early 20th century (as a live theater, it was acquired by Morris Schulman in 1926 and started to show movies. Sadly, Schulman never got to see the theater empire that the Schulman name would become, as he committed suicide in the backstage of the Palace Theater in 1935. His widow would later acquire the Queen, and ultimately pass the business on to Bill Schulman, who passed away in May 2013, even though by that time business had passed on to his sons and the Schulmans pulled out of Bryan-College Station. 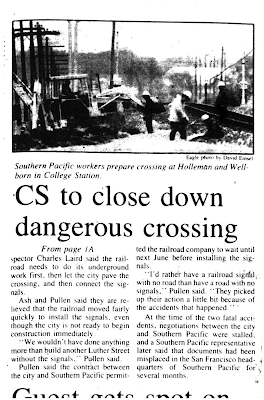 The Palace, along with others in downtown Bryan, closed in the mid-1980s (at the latest). Anyway, the Palace Theater was somewhat butchered in the renovation: apparently, the Palace is outdoor because the roof collapsed in 1986, but today the Palace exists even less: only the marquee is original (at best). See how many things you can spot that are distinctly different: where Stafford Main Street looks like the original building was destroyed, leaving only the facade, there's "Discount Trophies & Engraving" with some greenish tile: the facade was changed (restored or completely redone) for its current incarnation of EarthArt (DT&E appears at 4:35). You can also catch a glimpse of the late missed Los Norteños restaurant. Here's a few modern glimpses from summer 2013 (my pictures): here, here, and here. 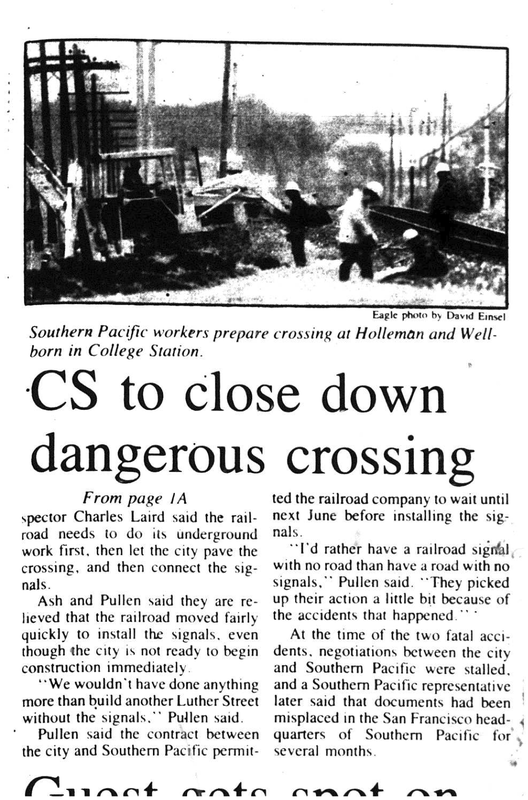 Hopefully you find this post interesting, as it's been sitting in the "back room" for years (it was originally published as "Downtown Bryan: At the Bottom of the Night"). 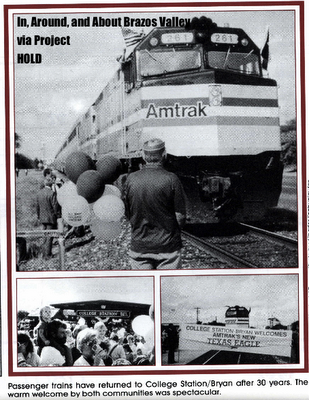 There's more coming that will be from storage from the old CSR&R or was haphazardly put in the Texas Avenue post. Unless you're new, I have already written "new" posts for the department stores of Post Oak Mall and the Food Court. Now, it's time to focus on the mall's in-line stores themselves, without the messy "Superpost" released a few years back. Unfortunately, if I tried to cover Post Oak Mall's in-line stores in fell swoop, there'd be chaos. I'd never get it done. Post Oak Mall opened in 1982 on the corner of Harvey Road and Texas 6 ("the East Loop") and was largely the catalyst for development on that side of town. 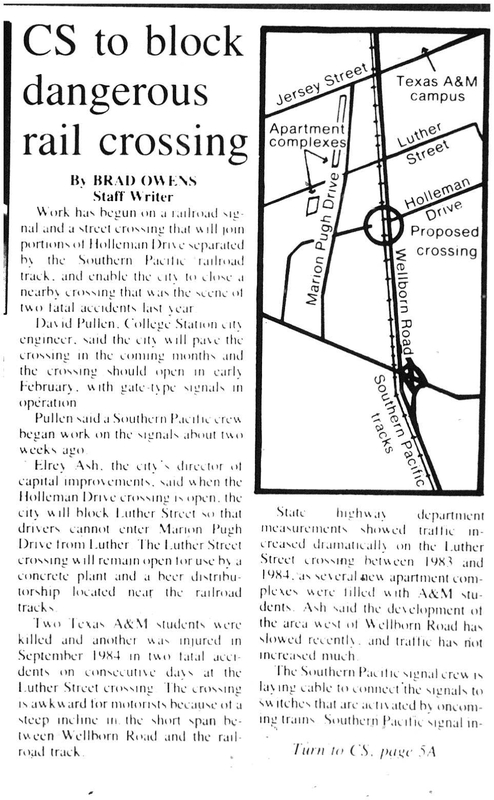 It included a small extension of Holleman from the frontage road (still two ways at this point) to just beyond the highway (taking over a small road called Sutton Place, we'll get to that later). It had four department stores at opening, with three more coming soon by the end of the year (the seventh anchor pad was never developed, though I can take stabs at what it could've been). Post Oak Mall was actually pretty small: it was under the general "regional mall standard" of 1,000,000 square feet of retail at only around 800,000 square feet, and the "department stores" were really small. Even the largest store, Foley's, was only around 103,000 square feet, far less than the Foley's branches in Houston, which were well over twice the size. 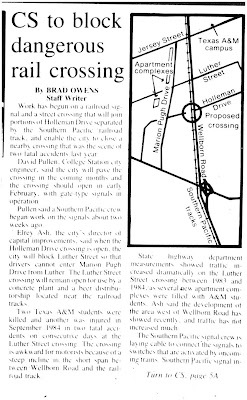 And yet it was huge: at the time, Southwood Valley was at more or less the far south part of town, and the "East Loop" was only about nine years old. There was nothing like it in town: Manor East Mall was much smaller and much less ornate, and in an area rich with the oil boom while the rest of the country was in recessionary effects, it was definitely right for its size. While one of the first promotional materials claimed the mall was "99% Leased", several didn't open until a few years after the mall did. I am not going to make a "final" version of this post anytime soon, but I'll do my best to describe in the details to which I have. The original mall in the 1980s was not as large as today ("large" being a relative term), it stopped at Wilson's. Manor East Mall was still going pretty strong at that point, having gained the first mall-entranced Wal-Mart store (and first in the county), and it would still do well up to the point where JCPenney left in 1985. The mall also had different tile, which was uncovered in summer 2012 in renovations. There were also large fountains. To see some more photos of photos of the past, including the old 1980s-style skylights that they replaced about 5-6 years ago, check out my Flickr account. 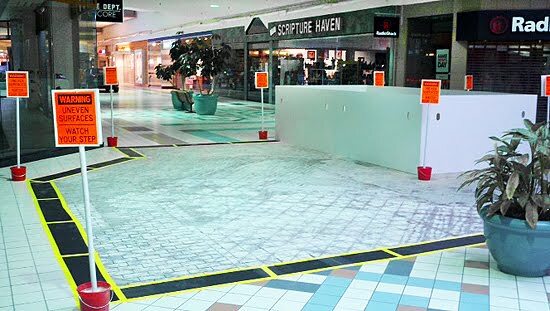 1994 was the year (or somewhere around those lines) when the mall was updated, gaining a new logo, new tile, and neon trim (which were all removed in the 2012 renovations). This list covers the in-line stores from 1982 to 1999 (in theory) using just three directories (a fourth early-1990s map wasn't used but may be covered at a later date). I do intend on updating the list with stores I missed with ads when needed. The stores tend to move around as you'll notice! 1. Card America - By 1984, this space was not shown on a mall directory, even though it says it was leased. That implies it had an incredible short life, or was not open yet at this time. Was it ever open? By the 1990s directory this was Summit Stationers. 2-3. Oriental Treasures and Rainbow Store - Little is known about these two stores, besides the fact that they probably sold what the name implied. The 1990s directory has this as Command Performance and Spencer Gifts, respectively. 4. D'Guiche Bed & Bath Shop in the 1980s. Lady Foot Locker was here in the 1990s. 5. Accessories by Taz - Besides the fact I think of the Looney Tunes character, this became a jewelry store, Christie's, by the 1990s. 6-13. We're not going to cover these, we already kind of did. 14 is the mall offices/restrooms/etc. This hasn't changed. 15-27. More food court stuff, see link. 17. The Wagon Wheel, in the food court. See the article regarding the food court (6-13). It was vacant by the 1990s. 18. Merle Norman - Cosmetics shop. I think this one is actually still open in this shop! 19. David Alan's Men's Shoes was here. By the 1990s, this would be "Pretzel Time", a pretzel shop. 20. Sweeney's - Jewelry store. This later became Babbage's (and eventually GameStop, but that's for another list). In better days, Babbage's was a computer store (bought Kid Pix Deluxe here in '96) and less focused on games. 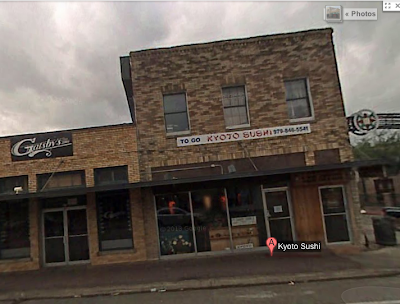 21 & 22 - More food-related establishments, check that article. 23. Cutlery World - No memories or any information on this, but I assume it sold kitchen knives. This became Afterthoughts by the 1990s, which was owned by Woolworth at one time. 24. Wicks 'N Sticks - A candle store. This would survive into the 2000s. 25. Lewis Shoe Gallery - another shoe store. This was absorbed into Wicks N Sticks by the 1990s. 27. Swensen's in the food court. Not covered today. 28. Time Out Family Amusement Center - This video arcade was in the mall for many years. At one point they were owned by Sega and even circa 1989, opened a massive "Time Out by the Court" center in Cincinnati's Forest Fair Mall. 29-31. More food court stands covered elsewhere, though I couldn't actually find 31 on the map. 32. Wild Pair - Shoes. This was a big mall chain in that era. By the 1990s, this was J. Riggings, another big 1990s chain (men's clothing) that fell by the wayside. You can see a picture of the storefront (partially) here at the now-defunct Mall of the Mainland. Beware: the outbound link is still written by me but it's very very old and contains writing that I now find embarrassing. 33. Jeans West - Pants. This was ALSO a big mall chain in that era. This space was absorbed into #32 by the 1990s. 34. Brooks Fashions in 1982. Casual Corner by the 1990s. 35. Lewis Shoe Gallery in 1982. This seems to be vacant in the 1990s. 37. 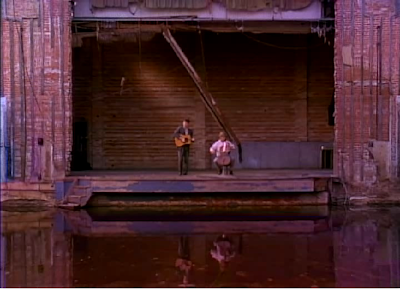 Thom McAn - In 1982, this was a shoe store. Thom McAn was another big chain store in the 1960s and 1970s, and I'm not entirely sure what happened to them. I think they were bought by someone later, as I saw the brand at Sears last time I went. Camelot Music would later be here by the 1990s. 38. Open Country - This was listed under shoes, so I'm guessing something like hiking boots? Payless ShoeSource occupied it later in a reconfigured space in this area. 39. Corrigan's - 1982. Jewelry store. By the 1990s, this became the location of Zales. 40 & 41. These aren't on the map either. The reason for these "missing stores" is likely because the mall was numbered before the configuration of tenants in the mall. Interestingly, 41 (but not 40) was carved out of the old space of 39. This was Adventure Travel in 1990s, a travel agency. 42. This was originally Rox-Z, a nightclub (it's unknown if it opened to the inside or not). 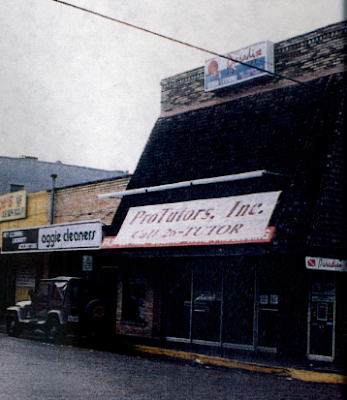 A later (by the 1990s) tenant, EyeMasters (which didn't use all the space). I don't know when EyeMasters opened. It was before 2000, as this website mentions, as it was open when Service Merchandise was still there. EyeMasters (now Visionworks) DOES have an interior entrance which suggests Rox-Z did too. Rox-Z was replaced in the late 1980s by something else later, which I swear came across in a phone book that I owned, but I can't remember. 43. This was a vacant, outside-facing exit that was never leased, apparently (ever). Later directories, such as my one from 2004, don't even bother numbering it. In a 1984 directory virtually unchanged from the 1982 preview one, the whole thing (A/B/C) is marked as 43 and that's mentioned as Armed Forces Recruiting. 44. This is where the Army/U.S. Air Force/Marines recruiting offices are now (but not the Navy, that's inside). 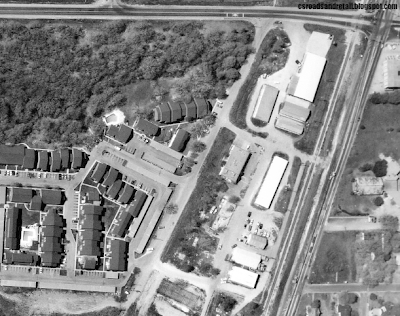 Interestingly, my late 1990s directory has these spaces marked as A, B, and C, and Casa Olé in space 44 (see below). 45. Casa Olé - CO opened the exact same day as the College Station Weingarten did. One of these remains dead and all but forgotten while the other one still remains alive. Guess which one? That's right, and Casa Olé still remains in the mall, despite middling reviews and a parade of new Mexican restaurants that opened in the years since November 1983. Better Mexican places had fallen since and Casa Olé remains open. It's strangely a bit comforting to have that link to the past, but still...better Mexican food out there. The later 1990s directory doesn't even list 45 at all. 46. Pet Emporium - What the 1983 directory lists. By the 1990s this would be absorbed into 48. 47. This number doesn't seem to be listed. By the 1990s this would be absorbed. 49. Great American Cookie Co., I don't think this has EVER changed. In malls in the 1980s, you could get broken pieces of cookies for fairly cheap, but I don't think they do that anymore and haven't for a long time. 50. General Nutrition Center - This hasn't a whole lot changed either. 51. This was the original home of Scripture Haven and later became home to Bath & Body Works. 52. Original home to Camelot Music and FootAction by the mid-to-late 1990s. 54. (There isn't a 53, either). In 1982/1983, this was "Worth's" by my 1990s directory it later became "Vanity". 55. The original home to J. Riggings, my 1990s directory doesn't have a store listed. 56. Scripture Haven - Scripture Haven is ALSO still there. That's three in a row. SH is a Christian bookstore, which means there's Bibles, Bible-related stuff, and a lot of related junk: candles, Precious Moments figurines, the works. When it opened, it was "Kid's Kasuals". 58. Originally "Courts Western Wear" (related to Courts Saddlery? ), this later became "Catalena Hatters Texas Store" (another Bryan reference). 60. There isn't a 59 and my 1990s directory doesn't list this one. 1983 directory says Team Electronics. 61. Original location of Coach House Cards & Gifts. 1990s directory lists nothing. 62. Hit or Miss - In the 1990s directory, this was empty, but when it started, this was Hit or Miss, an off-price shop. At some prior to 1989, this had been closed, a result of parent company Zayre Corporation reorganizing into the modern-day TJX Companies. This was a predecessor to TJMaxx in many ways, and possible that it was even closed when TJMaxx opened. 63-67. 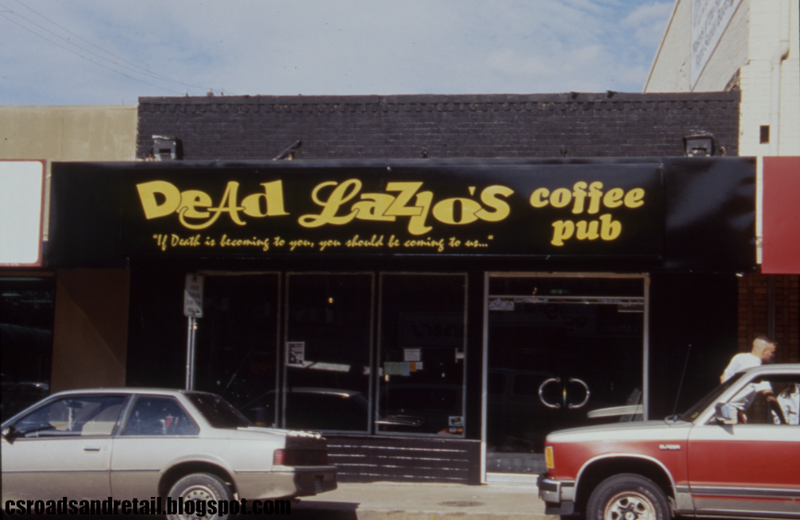 The Limited took up several spaces in the 1990s (before it closed and was absorbed into the even larger Steve & Barry's space in 2005) but this was smaller shops in the 1980s. Petite Shoppe was in 63 proper, 64 isn't on there, 65 is Athlete's Foot, 66 is T-Shirts Plus, which I think moved from Manor East. 67 was Zales. 68. Royal Optical. This remained throughout the 1980s into the 1990s. 69. Gallenkamp Shoes in the early 1980s. This was unoccupied in my undated 1990s directory. 70. Jo-Ann Fabrics/Singer in the early 1980s. The 1990s map has this vacant. 72. Originally 72 (no 71) was a large store that held Town & Country Furniture. By the 1990s this was Oshman's Sporting Goods, which may have filled in even by the late 1980s. Oshman's was a big sporting goods store found in malls and strip centers all over the Southern U.S. area, but disappeared over 10 years ago when what remained was converted by their parent Sports Authority. Even the old distribution center and headquarters in Houston was demolished for a Walmart a few years back. To get a good idea of what a typical mall Oshman's looked like, watch Bill & Ted's Excellent Adventure in which Genghis Kahn trashes one. 76. 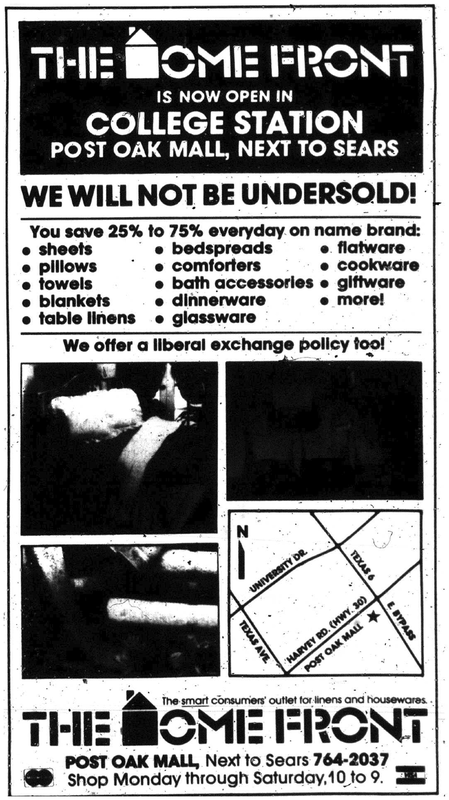 The Home Front - Much like Bed Bath & Beyond, this offered soft goods and other furnishings (silverware and others). 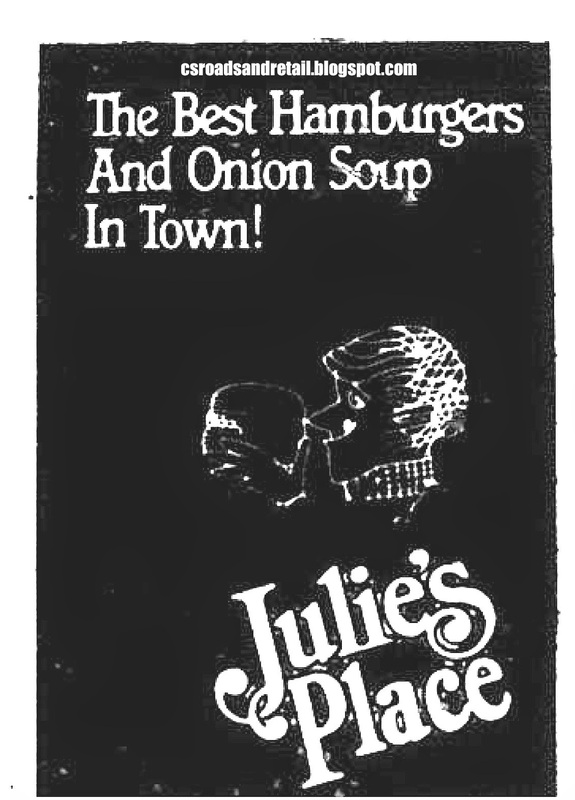 Here's an ad from 1984. You'll notice that I skipped 73-75, because they simply aren't shown. 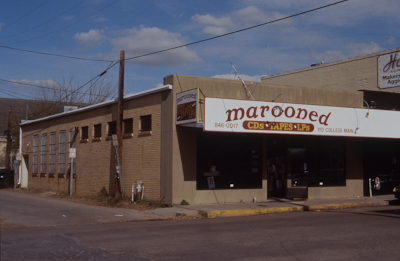 In the 1990s, this was the home of Brazos Valley Troupe. 78. Waterbed Gallery in the 1980s directories. The 1990s directory has this as a vacancy. 80. (No 79), in the early 1980s this was Command Performance, a salon that would jump around several places until finally closing a few years back. 81. Wasn't leased in the original map, and the 1984 map doesn't have a space for it either. 84. Upstage Shoes. I can't find a lot on this store, it was a chain in the 1980s. 85. Walden Books (original location). The store spaces 80-85 eventually combined into the "new" 85, which would be Lerner New York by the latter part of the 1990s. 87. The original "Lerners" was here in the 1980s. This became Lane Bryant by the 1990s. 90. Kinney was here in the 1990s, which almost certainly dates the map to pre-1998 since the division was shuttered that year. Kinney was a charter tenant too. 91. Chess King was here in a much smaller space before it became a large Gap store in the 1990s (ultimately in the early 2010s it would move out and turned back into smaller stores again, and by that time, Gap had become less relevant). Chess King was one of the big men's '80s clothing stores before the 1990s hit and Chess King fell into "checkmate", so to speak. 92. Foxmoor - women's clothing chain found in most malls in the 1980s and early 1990s. This was absorbed into the Gap later. 93 & 94. Gateway Cards and Gordon Jewelers, respectively. By the 1990s the spaces would be absorbed into the Gap, the Gap that swallows all store spaces! 95. The 1980s had this as Quick as a Flash. The 1990s had this as Little Havana Cigar Company. 97. This was Cinema 3 prior to 1998 (Plitt originally, then Carmike). The Wikipedia article for Post Oak Mall (which I will NOT list) says 1999 but I'm not sure because for years the article was aggressively squatted by a Wikipedia user (the type that seem to literally never sleep). Any confirmations as to when it closed would be appreciated (for years it said 2000, the date may finally be right this time). 99. The original space 99 was listed as MPACT, which based on my other phone book views seems to be some sort of charge card. 100. Casual Corner in 1982 and American Eagle Outfitters in the 1990s. 101. Absorbed into 102 by the 1990s. Bookland in 1982. 102. Walgreens - The first Walgreens in College Station-Bryan, though the merchandise line-up was slightly different (more drug store, less pharmacy). It departed in the early 1990s (my 11/89 phonebook lists it) and it wouldn't be seen in the area for a decade. When it did return to the trade area, it was in a different format (box type stores with drive through pharmacies). By the 1990s, the space had shifted around slightly, covering a slightly different space. It became a large Express store. 103. Exterior facing store. This was Navy recruiters in the 1990s but "Stay & Play" in the early days. 104. "Fashion Conspiracy" in 1982. No listing in the 1990s directory. 105. Foot Locker in the 1990s and 1982. 107. (No 106) Record Bar (early 1980s), Keta's Hallmark (1990s). 108. Kay-Bee Toys (Kay-Bee Toy & Hobby in the early days). 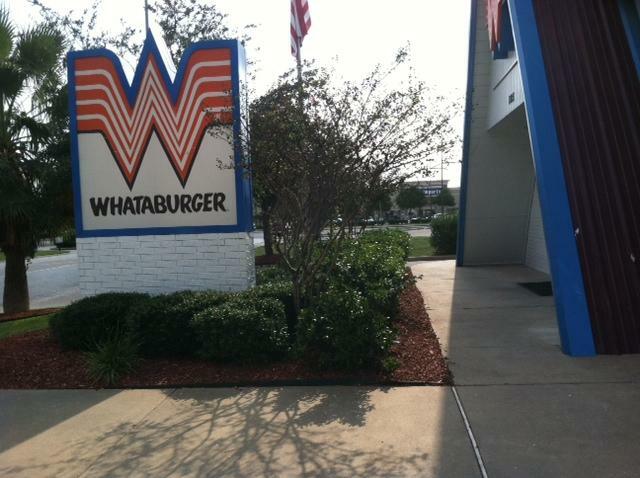 It was already gone by the mid-2000s, long before the chain closed for good. 110. (No 109) Baker's Shoes, and later Gadzooks. 112. Parklane Hosiery in 1982 (early mall chain) and later The Coffee Beanery Limited. 113. Trevor's (home décor) by the late 1990s, originally the large KG Men's Store. 116. This was originally a clothing store called "Pat Magee's" and by the 1990s (as early as 1993) "Nancy's Unique Boutique". 118. Marvin John's Big & Tall (117) and Shoe Designs (118) were here, they later became the new 118, LensCrafters (still here today). 121. Mission Jewelers was here in the 1990s. In the early 1980s it was "Mission Jewelry". 122. 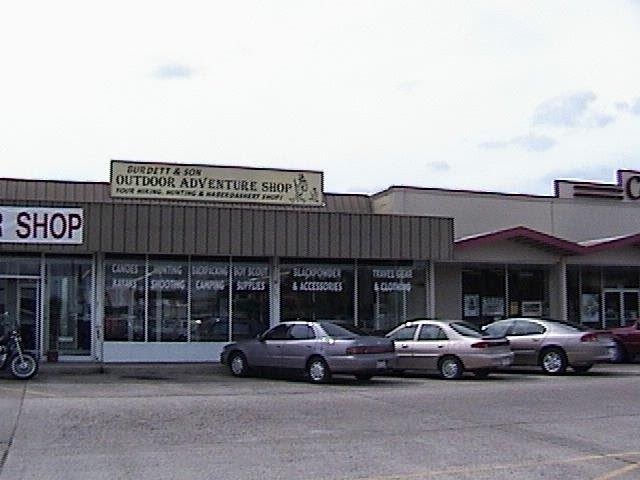 Although to the right of 123 (out of order), this was Eddie Bauer in the 1990s. The space where Eddie Bauer was had been a part of Woolworth (see 125). A rare case where a number is in the 1990s one but not the 1980s one. 123. Champs Sporting Goods was here in the 1980s. Interestingly, it later left for a number of years. By the 1990s it was Victoria's Secret, though much smaller than it is today. 125. Woolworth occupied a huge space here for over 10 years. It later went out of business in the early 1990s (still there in '93 and the only one left in town at that point). No 124. 126. Tinder Box (smoke shop?) was here in '82. By the 1990s this was Flowerama, a florist shop. 128. Regis Hairstylist in both directories. 129. Aggie Unlimited in the 1980s and Claire's Boutique in the 1990s. 130. 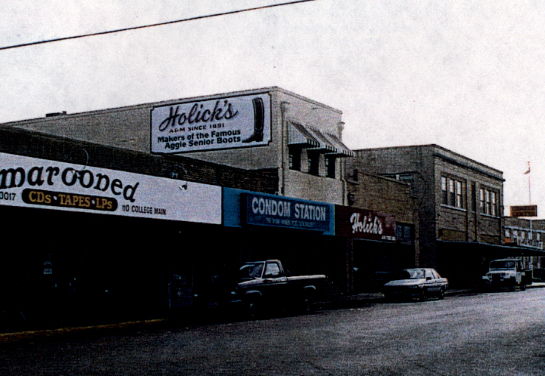 Herold's in the 1980s (strange spelling, I know) and The Shoe Dept. in the 1990s. 135. Video Concepts (aka VideoConcepts) in the 1980s, a Radio Shack spin-off (actually not a RS concept when it was leased, but it was acquired in '85). 131, 132, 133, and 134 don't exist. 136. Texas State Optical in the 1980s. By the 1990s this had reconfigured and was a different size and shape. This became Inspirations by the 1990s. 139. Waldenbooks. To note, the store between 138 and 139 isn't even numbered, as 138 and that store space were supposed to be lopped out for an entrance to a 7th department store that never came to be. Waldenbooks I'm not sure when it opened but it was noted for having a "Waldenkids" store within a store which seemed to not amount to more than that name on the overhang. Since Waldenbooks survived into the 2000s, we won't cover it today. 140. Keyboards of Texas. (probably "music keyboards" again). This isn't in the 1993 listing nor does it appear in directories from a few years later. 141. The Curiosity Shop. This is listed under both "Books, Cards, and Gifts" AND Women's Apparel. 142. Seems to be vacant. 143. Post Oak Pets. This opened fairly early on (probably one of the first in the JCPenney wing) but closed...2002? I remember the facade had painted clouds on it. 144. Another vacancy. This later became a candy/convenience store but that comes just a bit later. 146. 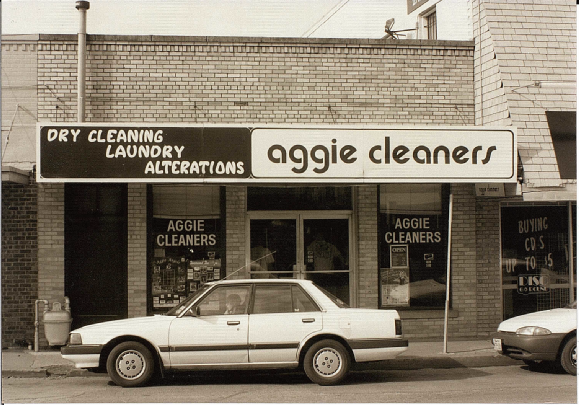 The final location of Aggie Unlimited. 148. First National Bank of Bryan. Although this survived into the late 2000s, I always felt it was kind of neat to have a bank inside of the mall. 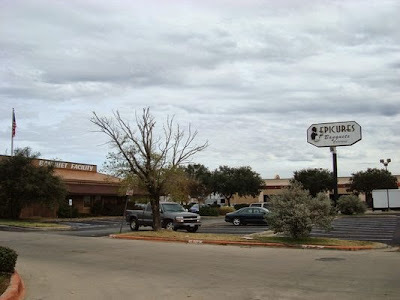 Well, they sold out to Franklin Bank Corporation in 2007, which went under in 2008 with all the remaining parts going to Prosperity Bank and somewhere in the scuffle FNB of Bryan shut down. 149. Luby's was here in the late 1990s, but it closed. It may have become something else immediately afterward but remained sealed off (décor mostly intact!) up until it was finally gutted. This begs the question...it's a large space and didn't seem to absorb anything else, because originally (at least in 1989 but not long enough for the 1992 directory) Wyatt's Cafeteria. 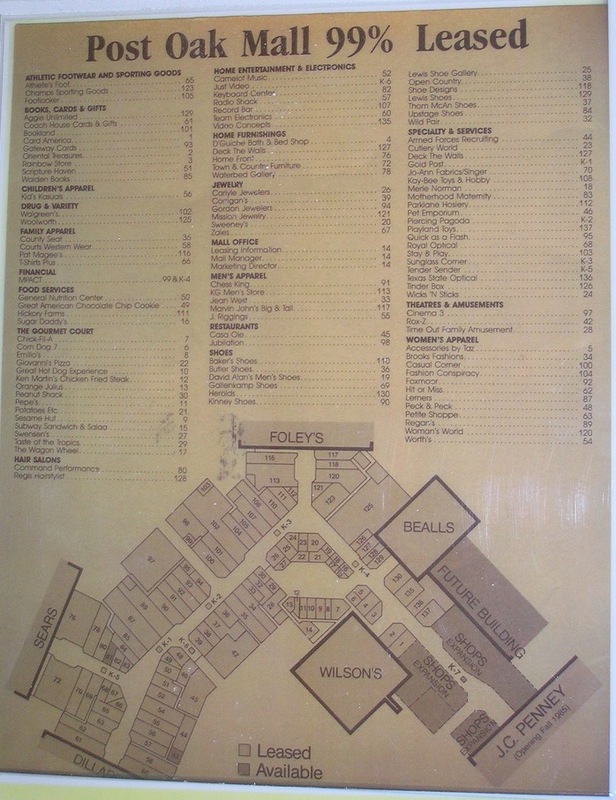 - The 1993 city directory (no map) lists a number of other stores in and around the mall including a mix of the 1985 and 1998 stores but also a few other items. There's "Sharkey's Big & Tall" (Marvin John's, or a different store? ), a dollar store (Everything's A Dollar), "Truly Texas" (a Texas shop but not the one that was near JCPenney for a while), Miller's Outpost (a chain), Brazos Valley Crime Prevention Info Center, "Kay's Cabaret" (former Rox-Z? ), Golden Chain Gang, "Brooks Fashions" (probably not Brooks Bros., name found in cross-referencing with phone book), BOTH J. Riggings and the Wild Pair, which means one of them had a different location at one time or the directory put both, "Desert Moon Trading Co.", "Bull Pen Sports Cards", "Fashion Fotos", "Jay Jacobs Stores of Fashion" (full name found in cross-referencing), Barry Jewelers, Score (sports-related items), Naturalizer, Fox Photo (was this inside or in a kiosk outside? ), McDuff Electronics (another RS spin-off). Likewise with the whole J. Riggings/Wild Pair mix-up, it's also important to note that both Kay's Cabaret AND EyeMasters co-existed which means one of them was in a different place. Naturalizer and The Cobbie Shop were also listed. Military Depot, of all things was here too in the early 1990s before moving to Eastgate. "Espresso Plus" was probably a kiosk. 5018 was Kay-Bee Toys, which is right where the store should be. 8000 was Payless ShoeSource, meaning it was where The Shoe Dept. later was, and 5000 1st National Bank originally had no exterior exit (space 100). - The permanent kiosks are as follows, but the numbering was different. In the 1990s directory as shown, K-1 was Jewel Time but in the 1980s was K-5 Tender Sender (wiring money?). Outside of #87 was K-2 (1980s is K-1) but is Gold Post (under Accessories, not Jewelry) both times. K-6 in the '80s but K-3 in the '90s was Just Video and Things Remembered, respectively. K-2 in the 1980s and K-4 in the 1990s was Piercing Pagoda both times. 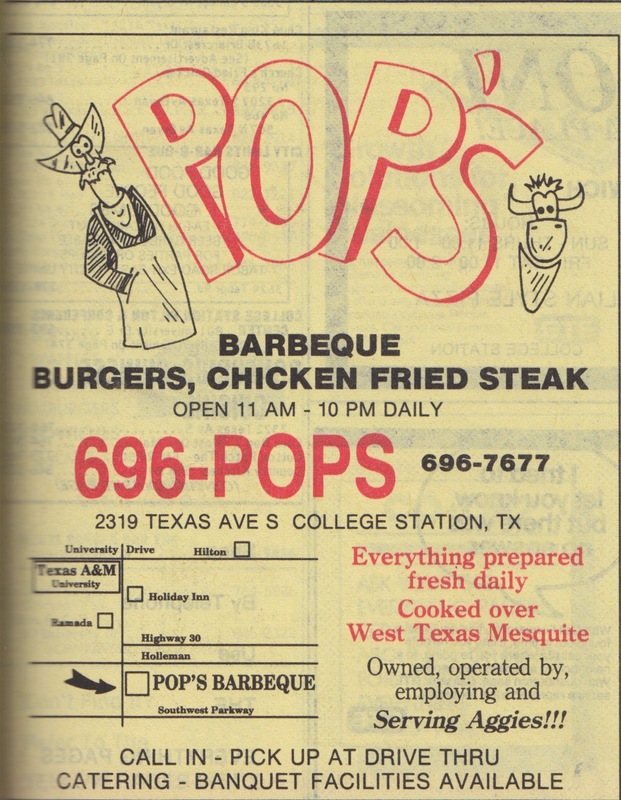 K-5 (1990s only) was the customer service booth. K-7/K-3 (1990s number on the left, '80s on the right until noted) was Sunglass Hut/Sunglass Corner. K-9 (1990s only) was Tropik Sun Fruit & Nuts. K-11/K-4 was D'or International/MPACT while K-12 (1990s only) was Gold 'N Silver. - I have ANOTHER directory (well, a picture of one anyway) but I have no idea what year it's from. It has Wyatt's, which WAS in the 1993 phone book (but not the 1993 directory), and it's obviously after the JCPenney wing opened. It also has Service Merchandise instead of Wilson's, which isn't that helpful since the JCPenney wing/Wilson's rebrand happened at about the same time. Anyway. The 1990s directory I was referring to HAD Luby's on it, which given it was not there in 1993 but closed around 1998, so that should give a clue to when it was published. And that's where you come in...if you could, please write down in the comments anything I missed between 1982 and 1999 (that does not include food court or department stores). I did put in a lot of time trying to write this post. - As you might have guessed, packing things into the Texas Avenue article is by and large a failure, so some of those are being split into new posts and such, such as the post the other day. - Because of the long time in making this post, I may be updating it instead of adding ANOTHER whole post (yikes) which I would update periodically. The reason for this is overlap. On the third hand I may end up making up a whole outsourced page to bring it together. Well, we'll see how many comments this gets and we'll run from there. I may be adding more ads to this anyway. Imagine an old white stucco type building here. Here it is...Rebel Draft House as it appeared in the mid-1990s (I have a color version but it's substantially more blurry). Anyway, as it appears here it was Second Chance Resale operated by the Salvation Army. Before that it was White Auto Parts, which closed sometime in the 1980s. Of course, it doesn't look like that now. In the late 1990s, the city invested money in Northgate and tore down the old building and erected "Northgate Center" (Brazos CAD says 2002 as build date), with one of its earlier tenants being New York Sub (not sure on the spelling, nor if it was the same as the New York Subs in Southwest Crossing, though the time frame suggests that they were the same) in suite A. Well, that lasted a few years before it gave way to bars entirely (one bar actually). I took this shot, which I pictured here in May 2014 looking east (from the other side of the building). While RBD has the distinction of serving me my first beer on Northgate (and that was only because I was on the right side of campus when that bomb threat happened in fall 2012), I don't care for it as it, like all the other bars, crank the music up so loud it's hard to hear anything (the bars probably had their best afternoon ever). In 2011, this was Luckie's Ice House (and before that, "The Drink", apparently). 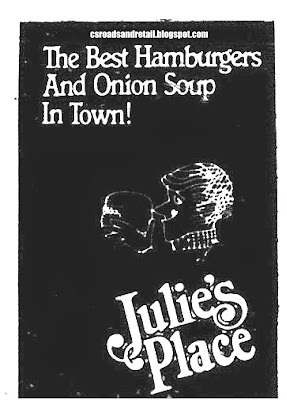 Between the time as Luckie's and RBD, RBD didn't do much more than just throw the Luckie's sign away. I'm sure I'm missing other tenants, though. Anyway, as for what it looks now from (roughly) the same angle, I took this picture in June 2014. Big change, huh? The Chase bank sign is just an ATM. Updated October 2015 with fixed errors and links. Further update in March 2019 to account for new building. Among the retail establishments off of Texas Avenue is Texas Avenue Crossing (a name not seen on signage, by the way) is also the only strip center for miles around with rooftop parking. If you have lived in College Station for more than six months, you've probably been here: it has a Panda Express, Cold Stone, World Market, Bed Bath & Beyond, Charming Charlie, Jason's Deli, and DoubleDave's. Of course, it wasn't always like that, and prior to 2003 (roughly), it was a completely different center. Opening in the 1960s at Jersey and Texas Avenue on a dairy farm, Redmond Terrace Shopping Center was the first strip center in College Station and featured a variety of stores, including a Ben Franklin five and ten, Brookshire Brothers, a post office, and Gibson's. All of these were housed under a continuous "squiggly roof" (not unlike the defunct discount store The Treasury). Here's one of the few photos I have of the original configuration, from a photo of a photo. Gibson's, of course, was the main anchor. Not a whole lot is known about Gibson's, as even when its largest franchisee (it was a franchised discount store, allowing it to spread across from Texas to Ohio with a variety of store formats) sued the chain and closed/renovated/reopened its stores (before going out of business in 1986, and some sources erroneously state Wickes BOUGHT the chain that same year, unless they sold it off later that year). A few pages do discuss this store, and the Dallas stores even included full supermarkets in theirs. 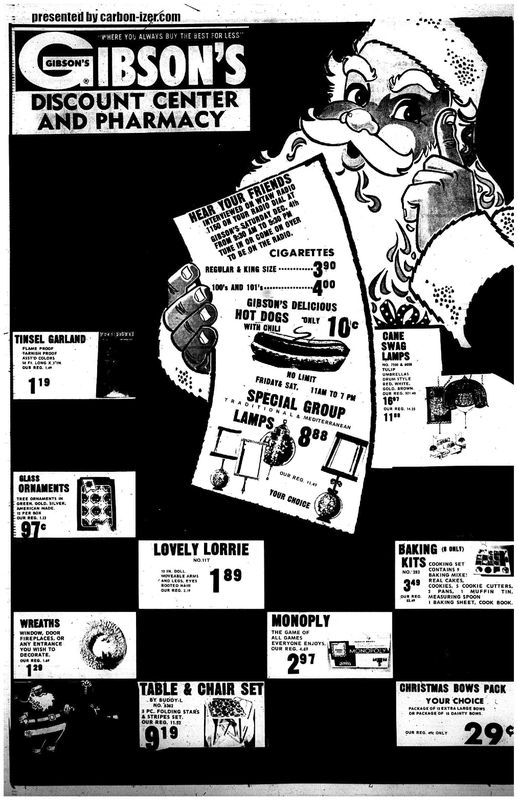 While the Gibson's here never contained such a thing, it did include a garden center and pharmacy, the latter indicated by this December 1971 ad from our very own The Eagle. It may have even had a snack bar. Get "Monoply" for the kids! From what I've read, though, Gibson's was a dump (I've heard someone tell me it smelled like tires). If we fast-forward, things started to change at Redmond Terrace...as stores changed, the squiggly roof went away, but only partially, leaving the center very disjointed looking. Academy would demolish or extensively renovate the Gibson's space. 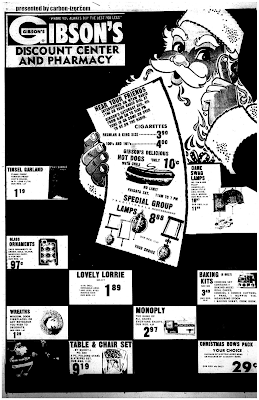 Piggly Wiggly would replace Brookshire Brothers and close early on (it was not very large at all, much smaller than even Navasota or Hearne's Brookshire Brothers). The post office was replaced with Joe's Used Books. 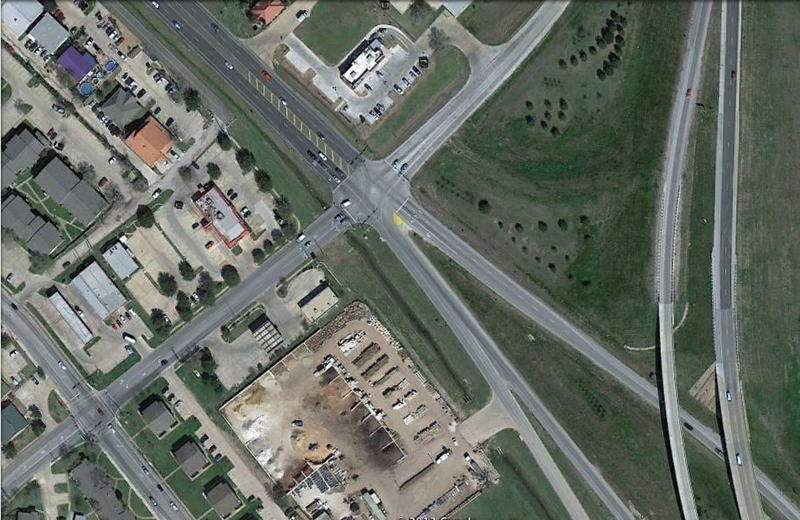 Jason's Deli (a Stacy's Furniture for a time, by address) would be on the far right of the center. Other stores included Burdett & Son's and Loupot's, as well as a mattress/furniture liquidator. Here's a picture of Burdett & Son's, in which you can see the original figuration as well. 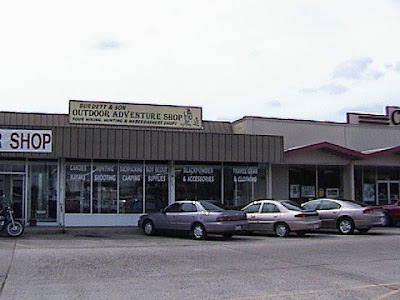 Burdett & Son was here from 1997 to 2002, as says their website. Copy Corner is off to the right. 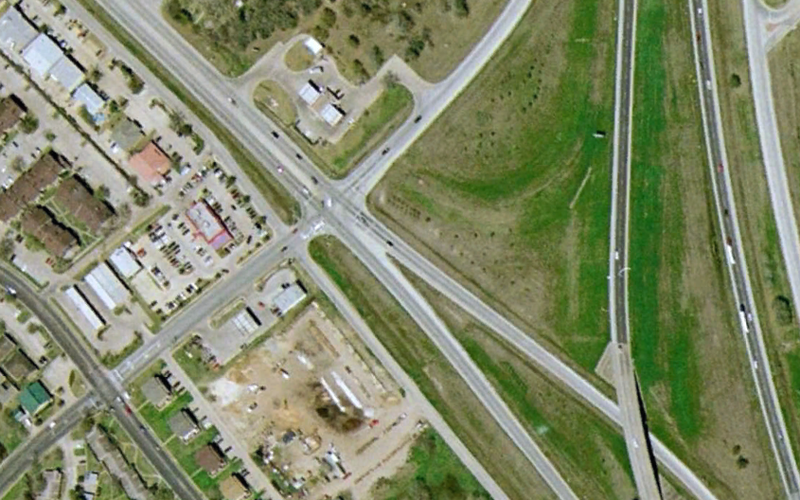 At the corner of George Bush and Texas was a Shell gas station with a Zip'N convenience store, but it was extremely small (or am I just remembering this wrong?). This went first with little more than some remains in a raised section of concrete to show that something was here. On top of Bed Bath & Beyond to Jason's Deli is that rooftop parking area, but it's never been very full. An elevator takes you back near BB&B. Over at the Shell spot, a new plaza was built with Panda Express (new to the market), Complete Nutrition (formerly "Bath Junkie"), James Avery Craftsman (originally something else? ), and Cold Stone Creamery (new to the market). TAC remains rather popular, having brought new retailers to the market and a popular lunch spot with inexpensive restaurants (Jason's Deli, particularly, remains a popular after-church spot). 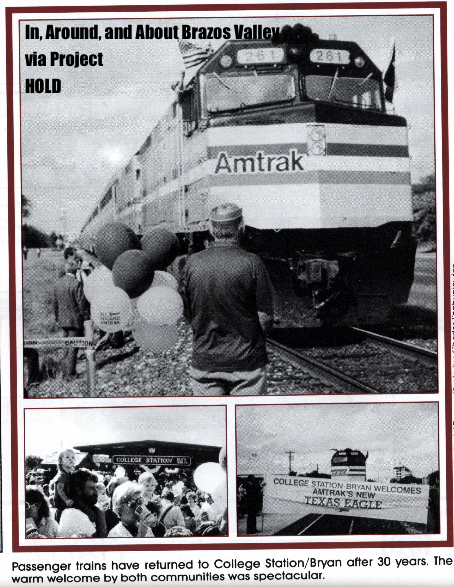 I've probably got some details wrong--directories aren't very helpful in this aspect, and I've obviously abridged some stuff, with this article mainly posted to just fill in gaps in dealing with the Texas Avenue post. If I have anything wrong, please mention it in the comments. 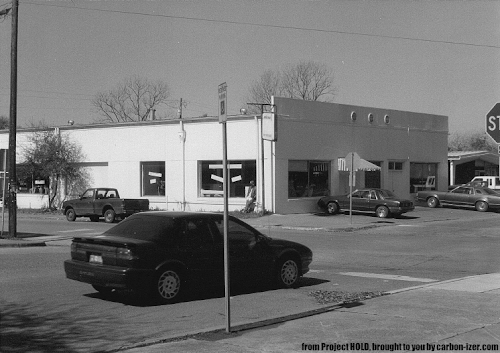 H-E-B built its first store in College Station in 1991 (according to InSite Magazine), a time when they were expanding like wildfire across East Texas and Houston area with "H-E-B Pantry Foods". Unlike the full line H-E-B stores, the Pantry stores were small even by early 1990s standards (averaging 20k to 30k square feet) and lacked departments that other stores had, only with a meat counter, produce, and a very small collection (maybe one aisle) of non-food items like HBA (health & beauty aids) and pet items. Unfortunately, since I have no pictures or even directories (I actually had two at one time, but I don't know what happened to them...if I find them, I'll tell you), I'll have to describe it. Instead of parking spaces in front of it like the other stores in the center, it had a large ramp in front of it for shoppers. Inside, it had mid-rising drop ceilings with a few random "Texas" graphics, such as a picture of a bunch of haybales scattered through a field. The produce was in the right side, there were ten check-out stands (with one being an express lane, 10 items or less), a photo developing kiosk, a "bakery" that didn't seem to make anything that fresh (fare was mostly limited to some tasteless bagels, the stuff that would be sold in the bread aisle today). 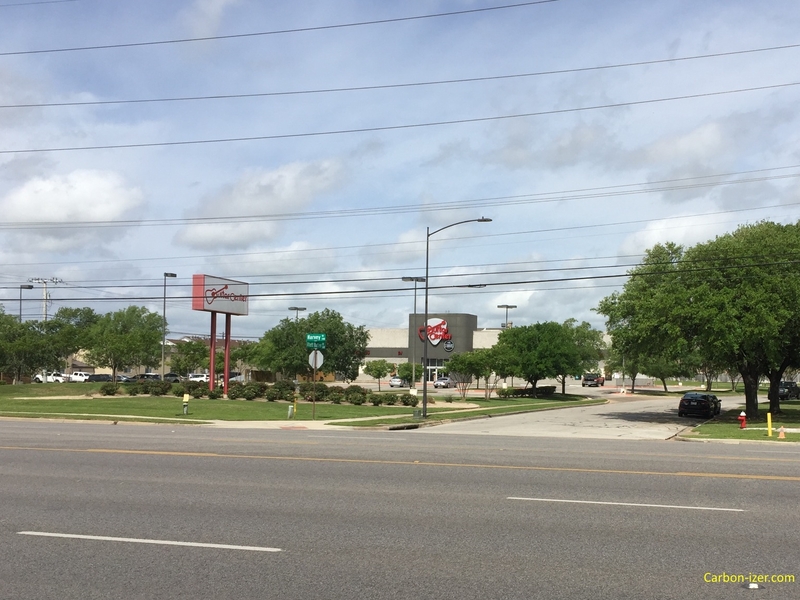 The three H-E-B Pantry stores in town (this one, and the two Bryan locations--were somewhat unusual, as at least from my knowledge, they didn't move into old stores, as in the Houston area, they were known to inhabit old stores like Safeway. In 2002, this store closed and was replaced with the massive and modern store across Holleman. That wasn't the end for the space, though in summer 2003, Gattiland closed its Bryan location and moved into the old Pantry Foods store within the month. Although I was getting too old to be part of the Gattitown demographic by the time it opened, I visited anyway, because it was new, and it was to be the latest in the technology. Gattitown totally rebuilt the facade (the Texas part remained visible from the back, but unless you lived in one of the apartments behind the complex, you could not see it) and removed the ramp in the parking lot, making it smooth. You also had to enter through the sides. This is the sixth restaurant to open under the GattiTown name and “eatertainment” theme, and each is decorated to reflect its community, Moffett said. At the College Station restaurant, an Aggieland Dining Room will be lined with reproductions of Benjamin Knox paintings. The drink station is positioned beneath a mock water tower, and other rooms include a city hall and a mock movie theater. The game room will occupy the entire back section of the restaurant, but Moffett said adults can find quiet dining areas in a corner cafe and the Library, which will have high-speed Internet connections and five iMac computers for customer use. Moffett said he plans to hire a full-time marketing employee to promote the restaurant’s meeting space, which is free to use once customers buy a meal. There also are two meeting rooms set apart from the customer traffic flow, and some of the dining rooms have sliding walls that can divide them into smaller spaces. The "mock water tower" was modeled after by-then defunct old water tower at the corner of Park Place and Texas Avenue, and as for the "Library", I never did find (employees didn't seem to know where it was, a sign of bad things to come), but it apparently did exist and was soon converted into another theater room. The midway area wasn't all that better than Gattiland, if anything, it seemed smaller. There wasn't even room for a playground. The old style tokens that Gattiland used was replaced by a card system. Well, initially Gattitown was a huge success and the parking lot stayed packed every Friday and Saturday night. But as the years wore on, Gattitown started to get competition in the form of Chuck E. Cheese which opened at Post Oak Mall in 2005, and at Grand Central Station, which happened soon after. Chuck E. Cheese did the most damage to Gattitown, with Gattitown's knockoff formula competing with the original, and just like that, Gattitown slid downhill just like its predecessor. It was pretty much exclusively for kids (no classic arcades, or even alcohol) for that matter, and even then stayed pretty empty except for the "Kids Eat Free" nights. In July 2012, Gattitown closed. The pizza was now abysmal (not even fully cooked) and Mr. Gatti's left the area for good after nearly 40 years of jumping around town. It wasn't the end of the space, though: in fall of 2013, it reopened as DSW (Designer Shoe Warehouse). Despite the fact that the facade of the old Gattitown/Pantry was completely covered up, the design restored the appearance of a retail store, so if you go inside and close your eyes you can almost remember how the Pantry used to be laid out.